The band was born when Thorsten was sitting in his dorm room in College Station, TX, playing the opening riff of a new song idea (now known as "Carry On") on an unplugged electric guitar. BC randomly walked by in the hallway and said "Hey, that's cool! We should try to do something with that! Hi, I'm Brian." Together, they started working on songs and looking for a drummer. 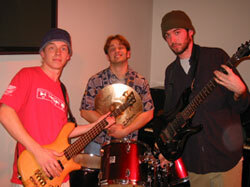 A few weeks later, Chuck joined the group and also named the band. 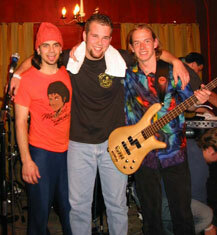 The Letter 3's first live performance was in March 2002 at the Northgate Music Festival in College Station. They played several more gigs in various bars in College Station for the rest of the school year. The performances were always marked by BC's crazy raw energy on stage, goofing around and usually ripping all strings off of his guitar at the end of the show. Unfortunately, after that summer BC moved back to the Houston area where he now plays with his new band The Crisis. Chuck became increasingly busy with school, and so the project was disbanded for the time being. After one of the last shows of the original line-up, Thorsten was approached by Eric Blews: "Hey man, I really liked your playing, I'd love to jam with you sometime." A few months later, they got together and jammed and immediately realized the potential they had to get a new band going. Now all they needed was a front man, and a few weeks later were joined by the wonderful Russell Huie, who had played as a support act for The Letter 3 and been very supportive of the band in the past. They played some old The Letter 3 songs and created new material with every jam session. It soon became obvious that The Letter 3 had been reborn with two new band members. Russell's laid back style and his beautiful singing and playing gave the band a whole new dynamic, and with the support of old and new fans as well as the marvelous Tim Britton, the band was ready to play live in just a few months. They played many shows in College Station over the next couple of months, including the annual Northgate Music Festival, which also featured a reunion of the original line-up for two songs towards the end of the set. However, after that summer people started leaving town and going their separate ways again, and the second incarnation of The Letter 3 came to an end.